Now that I’ve spent a little more time with Age of Wonders 3 – I think I’m near the end of my third campaign map – I thought I’d answer one of the questions I posed in last week’s preview. The first time I encountered massed shadow stalkers, I thought my massed draconian flyers – tier-3 warriors with similar headline stats, descended from ancient dragons – would be their match. One game over screen later, I learned to read the fine print: shadow stalkers resist physical damage, such as that from my poor draconians’ blades. But fine print cuts both ways. 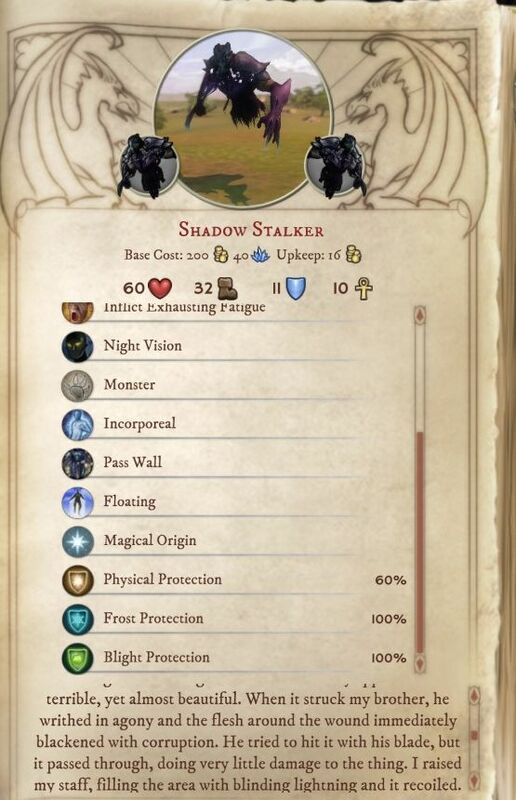 Shadow stalkers have no resistance to fire, and they have a little trait called “magical origin”. There is a support unit, the draconian elder, that can (a) lob fireballs and (b) set friendly draconians’ weapons alight . And there is a spell, Bane of the Unnatural, that grants mundane units – such as draconian flyers! – a bonus when attacking magical creatures. When the smoke cleared, my draconians stood triumphant over the charred remains of the computer’s shadow stalkers. Was my combination of magic, draconian elders, and draconian flyers decisive? Perhaps, perhaps not – they were just some of the toys I brought to the rematch. But it was enough to answer my question. Combining might and magic does pay off – both in efficacy and in sheer satisfaction! The above comments are based on a copy of the game supplied by developer Triumph Studios. Next Next post: Clippings: The Turtle Moves!